Bella has a home! 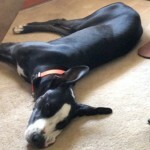 - Rocky Mountain Great Dane Rescue, Inc.
Bella has a home with her Foster Dad in Bozeman, MT. Jonathon is a personal trainer and enjoys being outside doing anything physical, so…. Miss Bella will be able to give him good company when hiking those Montana trails! Jonathon always dreamed of having a Great Dane of his own after growing up with them as a child. Bella will be an only pet, so needless to say she will be spoiled rotten! Jonathon has affectionately renamed this sweet girl to Luna! Way to go girl!